A post I read days back inspired me to create this Yogurt Blueberry Pancake Soufflé recipe. I was lucky to stumble upon an interesting blog called Cupcakes and Crab Legs. Susan, (the owner of the blog) wrote about her experience in Prairie Fire restaurant, she wrote about how good and fluffy their Lemon Pancakes were, and to make it more enticing she attached pictures. Those pancakes looked so good, and although I couldn’t taste them, being the stubborn foodie I am, I had to make them and keep them light too. After experimenting and failing few times Yogurt Blueberry Pancake Soufflé saw the light. These pancakes were everything I hoped for, light, fluffy, delicious, and I just love its soufflé like texture. I have used lemon zest in theses Yogurt Blueberry Pancake Soufflé, other times, made them plain, and sometimes went exotic and added saffron and cardamom. They tasted great each time. 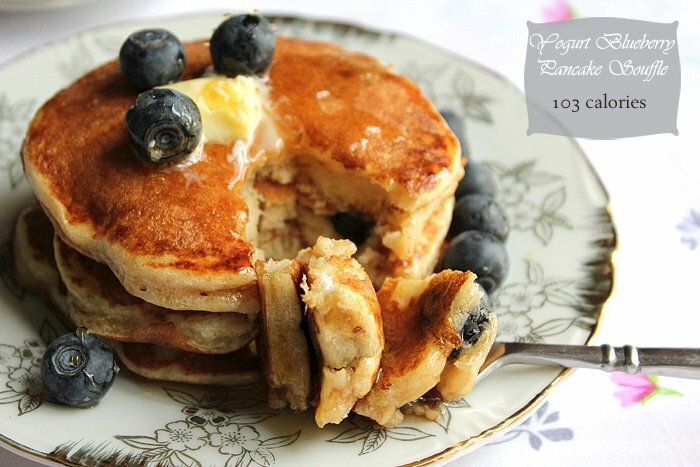 You can make these pancakes a day ahead and keep them in the fridge, I found the best way to re-heat them is on the stove. 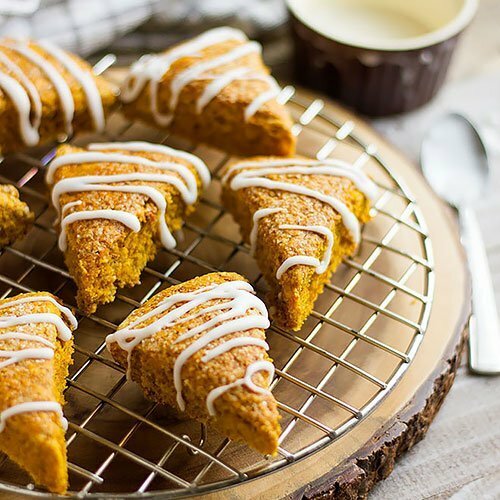 Their fluffiness and aroma were restored immediately, and they tasted like freshly made. 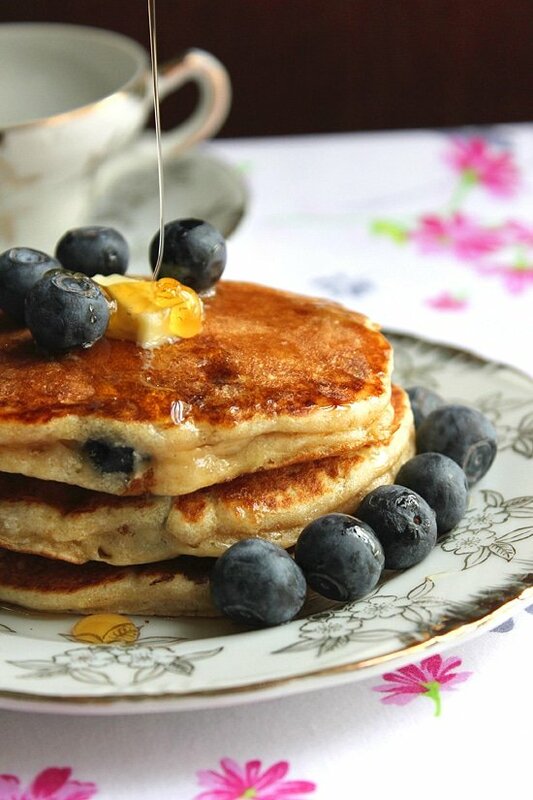 With such scrumptious pancakes, you need a classy companion, you can go for honey of course, but why not go for a treat? 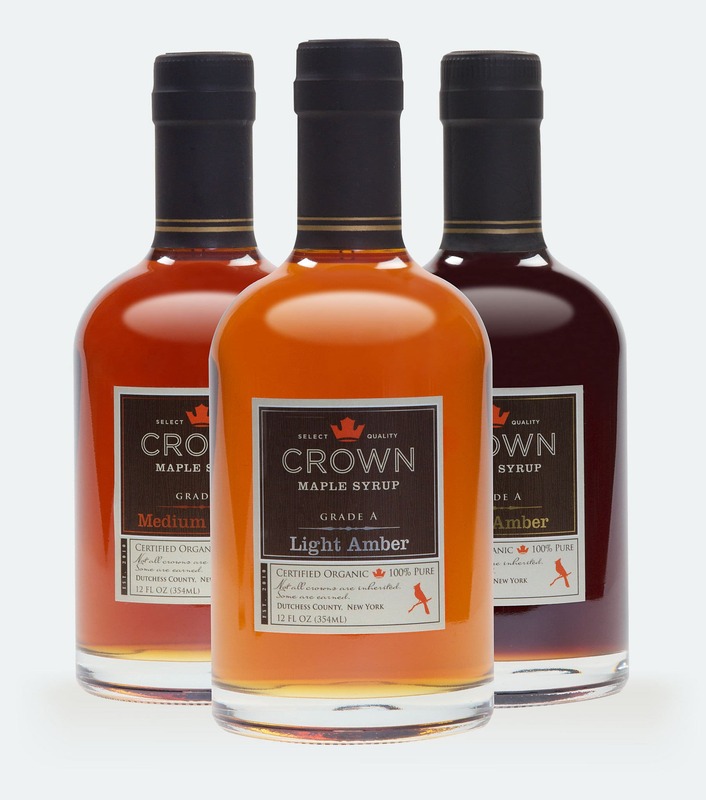 Crown Maple has a wide range of maple syrup flavors, pick your favorite flavor and pour it on the pancakes while hot, enjoy the explosion of flavors and experience a higher level of awesomeness. Pouring one tablespoon of Crown Maple Syrup on two hot pancakes is more than enough. Yes! When the quality of the syrup is high, a little goes a long way. Calories calculated do not include the syrup and the butter poured on top of the pancakes. In a bowl, whisk flour, baking powder, and salt. Keep aside. In a different bowl, beat egg yolk with vanilla, add butter, milk, yogurt, and sugar. Beat until well combined. Add the flour to the egg and butter mixture, and mix gently. You will see lumps, ignore the lumps and don't over mix. In another bowl beat the egg white until you get stiff peak. Add the egg white and blueberries to the previously prepared batter. Gently fold. Some egg whites should be seen in the batter, that means you didn't over mix it. Heat a frying pan to medium low. I didn't use any oil or butter since I'm using a non-stick pan. Pour 1/4 cup from the batter onto the hot pan. 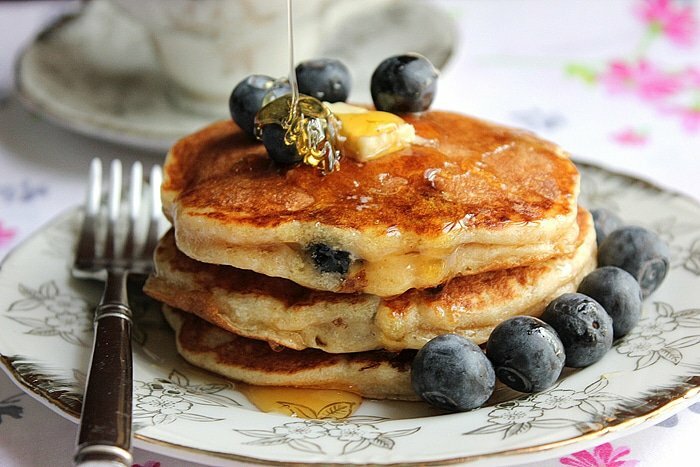 Cook for about two minutes or until the pancake's bottom is golden. flip the pancake gently. Cook the other side until golden then remove from heat. Note 1: Do not press the pancake down while it's cooking. Note 2: These pancakes when cold will wrinkle a bit, especially if kept in fridge. Do not worry, the moment you re-heat them they will look and taste fresh even the second day. They look so soft and beautiful! Oh yum!! I giving this recipe to my husband. 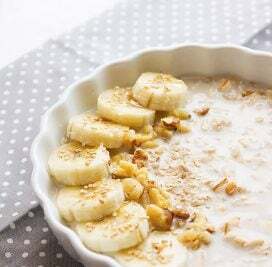 On Sunday mornings we splurge and have something wonderful for breakfast other than our usual yogurt, fresh fruit and granola. I can’t wait to try these. Pinning!! Fun and delicious video! Weekends have been so busy that we haven’t had proper pancakes for a while. 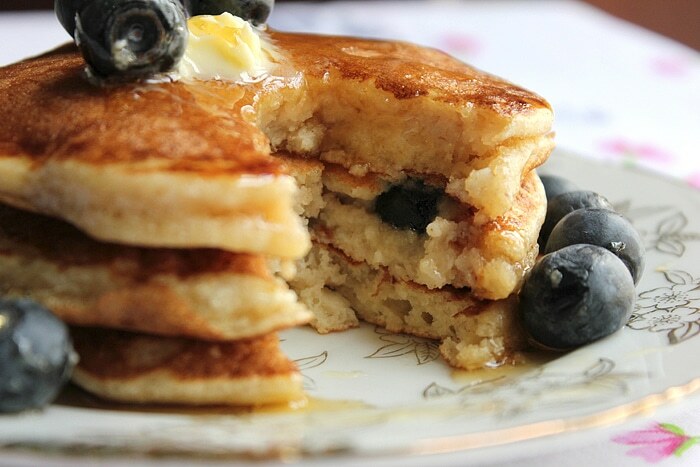 Now I’m craving these delicious pancakes!